I used this app because the Marine Corps Historic Half suggested it. I had never heard of it. The Historic Half was my first half marathon and I wanted to get the most out of it. Before I left to drive to packet pick up, I stopped at my local Apple Store to get a battery case for my IPhone 8. I knew that with pictures and this app running, that Apple battery would not hold up. I signed up for Motigo and sent the link to my family so they could record. I like that they could record from the website without having the app, but it seemed they still had to sign up?? Not sure if this is correct or I just misunderstood. Anyway, I recorded my own motivational talk at various miles markers as did my sister. The Historic Half event also preloaded recordings. During the run, they played loud and clear and were not too far off from the mileage points for which they were meant to play. 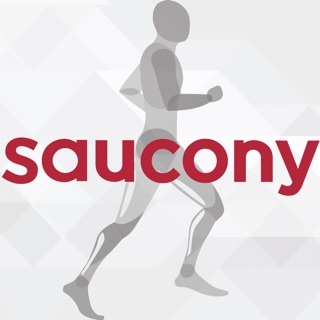 I used to listen to public radio while I ran but stopped about 5 months ago and this app will really help to break up the run and pump me up! I highly recommend it!! There were no problems and it worked as stated. Try it!! 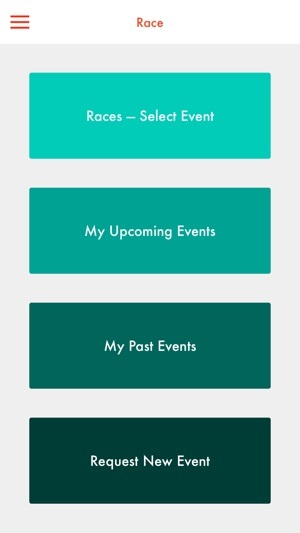 I am a 12 time marathoner and just learned about this app in time to use for my last race. I am coming off an injury and wasn’t sure how this marathon would unfold for me. It was so motivational and helpful to be able to hear the encouraging words of my family and friends throughout the race. There were times I was laughing because of funny messages and the smile stayed on my face the entire mile keeping me loose and taking my mind off how many miles I had left. I recommend this to all runners!!!!!! My only suggestion is a way for someone to delete or later edit a message if there was a mistake recording it. I know you can re-record but two messages a person accidentally hit send cheer and later wished they had redone it. 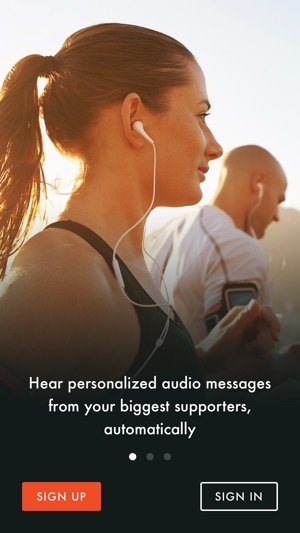 It also might be helpful for people to know which miles have cheers. It’s awesome to have multiple cheers at times but I would have loved to have some of those spread out to miles without a cheer. Overall, this app is AWESOME! Incredibly disappointing. I told so many of my friends about this app and even purchased the unlimited cheers version for $5. 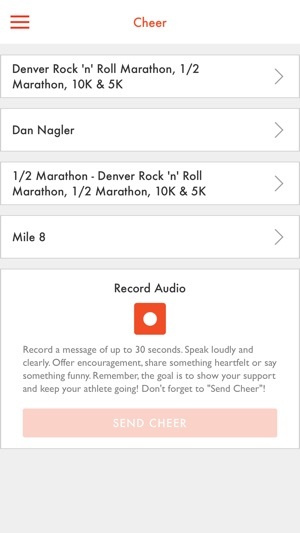 My friends and family recorded 118 cheers for me for my first Boston Marathon I was running in memory of my mom. Big day to day the least. 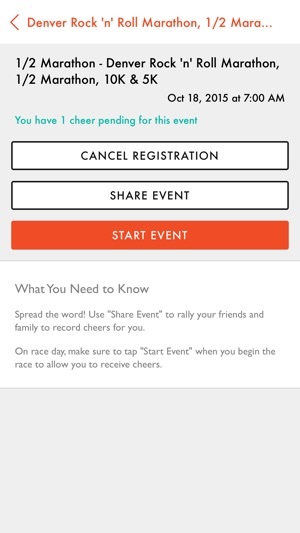 I tried reopening the app on mile 10 and once I press start event it just closes. Once I got home, I restarted my phone. Same thing. Tried searching everywhere for help/support contact. No where to be found in the app or website. When you click app support or just brings you to the home page... But there is no contact info there. I still really want to listen to my cheers but don't know who to ask for help. I used this app once before and thought it was great, now I'm 50/50 :( please help.